Fats are the most prevalent class of compounds (in living systems) referred to as lipids . Lipids are cellular compounds that are insoluble in water. Fats are soft, low-melting solids, with a density less than that of water. They have a greasy feel and are slippery. Because fats are insoluble in water and less dense than water, after meat that has a lot of fat in it has been cooked, upon cooling a layer of fat often appears on top of the juices. Fats and closely related oils are mixtures of compounds consisting of fatty acids combined with glycerol (commonly known as glycerin) via ester linkages. Fatty acids are long, straight chain carboxylic acids. A fat (or oil) is formed when three fatty acid molecules react with a glycerol molecule to yield a triglyceride (and three water molecules). (See Figure 1.) Fats in the body are transported and stored as triglycerides. Figure 1. The formation of a triglyceride of stearic acid. additions of two-carbon acetate groups in a stepwise cyclic reaction. Some fatty acids found in nature are shown in Table 1. Dietary fats and oils are both triglycerides. Fats are generally solids and oils are generally liquids at ordinary room temperatures. The characteristics of fats and oils are related to the properties of the fatty acids that they contain. The larger the number of carbon atoms, the higher the melting point ; the larger the number of double bonds, the lower the melting point. Oils contain a higher percentage of unsaturated fatty acids than fats. Fats from animal sources tend to be solids and fats from vegetable sources tend to be liquids. Thus fats are often referred to as "animal fats" and "vegetable oils." There are about forty naturally occurring fatty acids. The fatty acids without carbon-carbon double bonds are classified as saturated, and those containing carbon-carbon double bonds are classified as unsaturated. Palmitic and stearic acids are the most common saturated fatty acids, and oleic and linoleic acids are the most common unsaturated fatty acids. Oleic acid is monounsaturated because it has only one carbon-carbon double bond. Linoleic, linolenic, and arachidonic acids are polyunsaturated because they have two, three, and four carbon-carbon double bonds, respectively. A way to measure the relative degree of unsaturation of a fat or an oil is to determine its iodine number. The iodine number is the mass of iodine, in grams, that is consumed by (reacts with) 100 grams of a fat or an oil. Iodine reacts with the carbon-carbon double bonds. Thus the greater the number of double bonds, the higher the iodine number. In general, fats have lower iodine numbers than oils because oils have greater percentages of carbon-carbon bonds that are double bonds. For example, typical iodine numbers for butter are 25 to 40, and for corn oil, 115 to 130. In addition to their reacting with iodine, unsaturated fats and oils react with hydrogen. Like iodine atoms, hydrogen atoms add across the carbon-carbon double bonds. Vegetable oils, with their higher degrees of unsaturation, can be converted to solids via reaction with hydrogen in a process called hydrogenation. A polyhydrogenated fat is one that has been altered by such a reaction. The reaction may cause the oil to become a solid. Margarine and shortening are vegetable-based oils that have undergone partial hydrogenation. Because the amounts of hydrogen added can be controlled, the products of these reactions can be engineered to have specific properties, such as degrees of softness and a chosen melting point. The peanut oil in peanut butter usually has been hydrogenated to prevent it from separating. Another product of partial hydrogenation is a class of fats called trans fatty acids. Foods high in trans fatty acids (for example, margarine, shortening, and commercially fried food) tend to raise cholesterol levels in the blood. in the fatty acids of a glyceride, the lower is the melting point and the more likely the glyceride will exist as a liquid at room temperature. 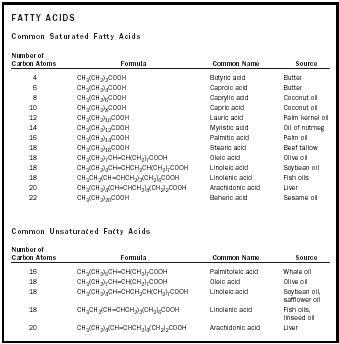 Figure 2 shows the composition (in terms of their saturated, monounsaturated, and polyunsaturated portions) of some common fats and oils. Note that the oils tend to contain fewer saturated fatty acids. Coconut oil is an exception; although it does contain an ample amount of saturated fatty acids, approximately two-thirds of its fatty acid content is derived from lauric and myristic acids. Lauric and myristic acids have shorter chains of 12 and 14 carbons, respectively, and they are responsible for the low melting point of coconut oil. Because fats and oils are triesters of glycerol, they react with water to form fatty acids and glycerin. When the reaction is carried out in a basic solution, salts of the fatty acids are produced instead of the fatty acids themselves. The salts of fatty acids are soaps and an individual molecule is characterized by an ionic end (the salt part) and a nonpolar end (the hydrocarbon part). The ionic salt end is water-soluble and the nonpolar hydrocarbon end is water insoluble. The process of making soaps by treating fats and oils with basic substances is called saponification (which means "soapmaking"). Pioneers made soap by adding lye (the base sodium hydroxide) to animal fat, and then heating the mixture. The soap rose to the top of the pot and solidified upon cooling and the glycerol remained at the bottom. Fats and oils can be characterized by their saponification numbers. The saponification number is defined as the number of milligrams of potassium hydroxide needed to saponify completely one gram of a fat or an oil. One mole of fat requires three moles of potassium hydroxide for complete saponification. If a fat contains fatty acids of relatively high molecular weights, then one gram of the fat will consist of fewer moles. Thus, fats having greater percentages of high molecular weight fatty acids will have lower saponification numbers than fats having greater percentages of lower molecular weight fatty acids. Lard, which contains mostly 16– and 18–carbon fatty acids, has a saponification number range of 190 to 200. Coconut oil, which is about 50 percent lauric acid, a 12–carbon fatty acid, has a saponification number approaching 260. Fats are necessary to maintain the body. Dietary fats exist mainly in the form of triglycerides. Fats are classified as high-energy food. They provide about 9 kilocalorie (kcal) of energy per gram consumed. In contrast, both carbohydrates and proteins provide about 4 kcal of energy per gram consumed. As a result, fat is the most efficient way to store energy. If one consumes more calories than he or she needs, some of the excess calorie source is converted to fat. It is generally recommended that not more than 30 percent of one's dietary calories should derive from fat (and of this 30 percent, 10 percent should be monounsaturated, and 10 percent, polyunsaturated). It appears that consumption of greater amounts of saturated fats (compared to amounts of monounsaturated and polyunsaturated fats) is related to higher levels of cholesterol in the blood and a greater risk of heart disease. In the United States the average diet is about 34 percent fat and (13 percent saturated fat). Because an average American diet tends to be higher in fats than what is recommended, there have been quests for substitutes for fat. Three products were first marketed as fat substitutes in the 1990s. The first was Simplesse, made by G.D. Searle. It is a low-calorie fat substitute made from milk protein (whey). The whey is made to undergo a microparticulation process that produces microparticles and prevents the formation of larger particle aggregates. The small size and uniformly spherical shape of Simplesse particles are responsible for this product's resemblance to a creamy fluid. The texture of Simplesse is similar to that of fats, and its use in frozen desserts can inhibit the growth of ice crystals. Simplesse is used in cheeses, frozen desserts, dressings, spreads, and puddings. It cannot be used in foods that require baking or frying. Another product is Olestra, made by Procter and Gamble, and it is sold to food producers as Olean. It is an ester of sucrose (instead of glycerol), and it is used as a substitute for fats in potato chips, crackers, and tortilla chips. Olestra's similarity to fats with respect to molecular structure contributes to its ability to mimic the mouth-feel of fat. However, it is much bulkier than a triglyceride-containing food, and this bulkiness prevents it from being digested and absorbed by the body. Thus it has no dietary caloric content. Potato chips fried in Olestra have 75 calories (instead of the 150 calories corresponding to chips fried in fat the traditional way). Like fat, Olestra is nonpolar and can dissolve other fat-soluble substances, including the fat-soluble vitamins A, D, E, and K. It is problematic that Olestra absorbs these vitamins that are stored in fat and are necessary for good health. Olestra is therefore fortified with vitamins A, D, E, and K to prevent it from depleting the body's supply of these vitamins. Although theU.S. Food and Drug Administration has found Olestra to be safe and has approved its use in snack foods, it required warnings on products containing Olestra because of undesirable side effects, such as diarrhea and abdominal cramping. A third fat substitute, Z-Trim, has been developed by the U.S. Department of Agriculture. Originally called Oat-Trim, it is made from agricultural by-products, such as the hulls of oats, peas, soybeans, and rice, or bran from corn or wheat. Because it is made from natural dietary fibers, it is digestible. Not only does it lower fat consumption, it also provides fiber for the diet. Z-Trim can be used as a fat substitute in cheese products, baked goods, and hamburgers. Brownies containing Z-Trim are 16 percent fat (compared to 25 percent for traditional brownies). Although fat substitutes may reduce the caloric contents of the foods in which they are used, caution is still necessary. Foods labeled "fat free" are not "calorie free." If an individual feels that he or she can eat more of a food containing a fat substitute, his or her total caloric intake may actually increase. SEE ALSO Detergents ; Lipids ; Soap . Bailey, Phillip S., Jr., and Bailey, Christina A. (2000). Organic Chemistry, 6th edition. Upper Saddle River, NJ: Prentice-Hall. Hill, John W., and Kolb, Doris K. (2001). Chemistry for Changing Times, 9th edition. Upper Saddle River, NJ: Prentice-Hall. Stanitski, Conrad L.; Pryde Eubanks, Lucy; Middlecamp, Cathrine H.; et al. (2000). Chemistry in Context, 3rd edition. New York: McGraw-Hill. Calorie Control Council. "Fat Replacers: Ingredients for Healthy Eating." Available from http://www.caloriecontrol.org/frgloss.html . Clemson University. Nutrition Information Resource Center. "The Simplesse Substitute." Available from http://virtual.clemson.edu/groups/ . C. P. Kelco Company. "Simplesse." Available from http://www.cpkelco.com/food/ . Hardin, B. "USDA Develops Tasty, No-Cal, High-Fiber Fat Substitute." Available from http://www.ars.usda.gov/is/ . Procter & Gamble Company. "Olean." Available from http://www.olean.com/ . Sports, Cardiovascular, and Wellness Nutritionists. A Dietetic Practice Group of the American Dietetic Association, eds. "A Primer on Fats and Oils." Available from http://www.eatright.org/nfs/ . U.S. Food and Drug Administration. "Olestra and Other Fat Substitutes." Available from http://www.fda.gov/opacom/ . How many fatty acids are used in the chemical process of making biofuels. I tried looking for the answer, but i can't find it in your article and I'm really confused. Can you explain it to me please. Is there any specific temperatures for oxidation of different fatty acids? Or Is there any relationship between the melting point and oxidation temperature of fatty acids? There is no specific temperature for oxidation of unsaturated fatty acids. The most important parameter is still the temperature, because the temperature and the oxidation of unsaturated fatty acids are proportionally. keep in mind that the more unsaturated they are the faster oxidation occurs. With the exception for conjugated polyunsaturated acids, these are more stable due to the conjugated system. p.s. I would guess that the position of the double bond also plays part in the oxidation rate, but i'm not fully sure about that. how good is coconut oil compared to other oils ,and fats at being used to extract flavors/active compounds of plant material? Or is there another that would be better?